There are six surviving subspecies of tiger: Amur tiger, Bengal tiger, Indochinese tiger, Malayan tiger, South China tiger and Sumatran tiger. Although they all live in slightly different environments, the areas in which they live are fairly similar. Sadly, tigers' natural habitats are being rapidly destroyed, causing these beautiful creatures' populations to decline. Despite their dwindling numbers, tigers are fairly widely distributed, although their current range is just 7 percent of its former size. They can be found in Bangladesh, Bhutan, Cambodia, China, India, Indonesia, Laos, Malaysia, Myanmar, Nepal, Russia, Thailand and Viet Nam. However, a century ago they could be found in much larger numbers, almost everywhere across Asia. In order to survive, tigers need to live in areas with dense vegetation, access to water and large ungulate -- or hoofed -- prey. The exact habitats the different subspecies of tiger live in varies, although they generally live in forests. For instance, Amur tigers often live in snowy coniferous forests, whereas Bengal tigers live anywhere from mangroves to temperate forests, and Indochinese tigers live in both highland and lowland tropical deciduous, mixed or coniferous forests. Perhaps the most obvious adaptation that tigers have is their striped coats. As sunlight filters through the canopy, down to the forest floor, it creates stripes of shadow, much like tigers' markings. 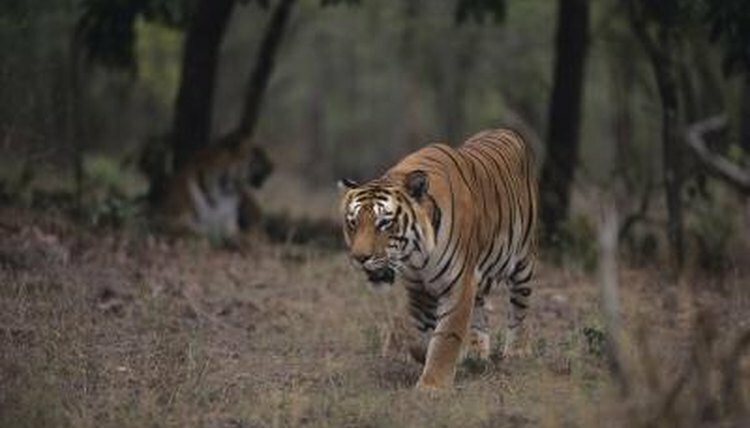 As such, tigers' coats help them to blend in with the undergrowth in a forest environment. This camouflage makes it harder for their prey to spot them, thus making them more successful hunters. There are a range of other adaptations that make it easier for tigers to thrive within their environment. They have a special adaptation to their retinas, which allows more light to reflect back into their eyes, making it easier to see in the dark. They also have extremely good hearing and are even able to pick up infrasound, which makes it easier to hear and communicate over long distances in the forest, because infrasound can pass through trees and other objects. They also have large teeth and long, retractable claws, both of which help them to hunt. WWF: Where Do Tigers Live? What Type of Environment Does a White Tiger Live In?